Brian Joss – Volkswagen signs Memorandum of Understanding with the Ethiopian Government to develop automotive industry Volkswagen has signed a Memorandum of Understanding (MoU) with the Ethiopian government to collaborate and deliver a joint vision for the development of an automotive industry in the country. Schaefer commented: “Our Sub-Sahara Africa strategy is gaining momentum with the signing of the third MoU in the last six months. We are grateful for the support and vision of the Ethiopian Government in identifying the automotive sector as one of the key manufacturing industries that can help the country to realise its Vision 2025 goals. As one of the fastest growing economies, and with the second highest population in the continent, Ethiopia is an ideal country to advance our Sub-Sahara Africa development strategy. Abebe Abebayehu, Commissioner of the Ethiopian Investment Commission (EIC) said: “Ethiopia is in a remarkable economic, political and social transformation that puts inclusive and sustainable growth, and private sector development, at its heart. With a fast growing economy and stellar performance on FDI inflow, Ethiopia is asserting itself as a competitive and preferred location of choice for investment. 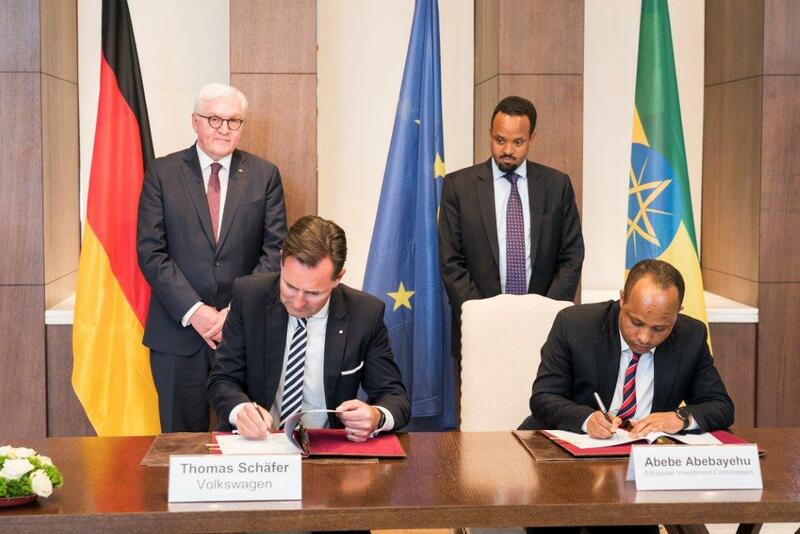 This MoU signing with Volkswagen is yet another testimony that Ethiopia is open for business. “Volkswagen welcomes the G20 “Compact with Africa” initiative in Ethiopia. The German Government has been very supportive of our expansion strategy into Sub-Sahara Africa. We are as committed to the success of Africa as they are,” concluded Schaefer.